Our goal is to help you reach your fundraising goals. Start by browsing our ready-made fundraising campaign templates featuring the tools you need to succeed. Our templates have been created from fundraisers proven to work with your next campaign in mind. And if you don’t see one that fits your needs, use our platform to design your own. Once your template is selected, customize it to your group’s uniqueness. Each template is fully editable and comes with high quality images, copy to inspire your supporters, suggested products and more. TeamWorks has created all the correspondence you need to raise more money easily. We’ve got you covered from outreach emails to increase participation from your group to a “Thank You” email to your supporters. 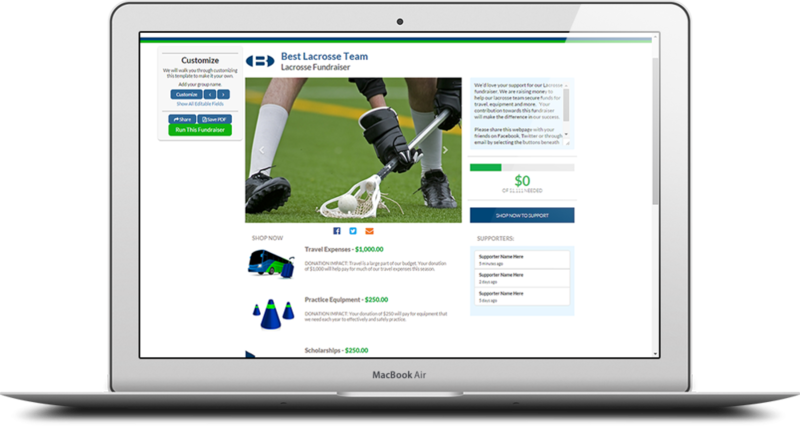 Rally your members and organize your Group into categories such as Varsity, JV, Classroom, etc. Boost your fundraising efforts by easily connecting your webpage with the leading social media sites, email, text and more. Make it easy for your Supporters to find your online fundraiser using social sharing tools and integrated emails. We have all the tools needed to help you raise money both online and in-person, including brochures, order forms and more. Our technology makes it even easier for you to process payments online. Forget the hassle of managing checks and cash - we’ve got you covered. TeamWorks accepts major credit cards, debit cards and E-checks. Our hosted platform ensures security for all transactions. We process the payments and pay you monthly. Learn more about our full pricing structure here. Track your progress and see your results throughout the campaign. Use this data to manage the campaign or reward incentives to your participants. All your campaign data and supporters are saved for future fundraising campaigns, so it’s even less work next time.